Moments from kickoff. Purple Raiders are in all white. Warhawks in purple jerseys with silver pants. Mount Union looking for its 12th national championship. 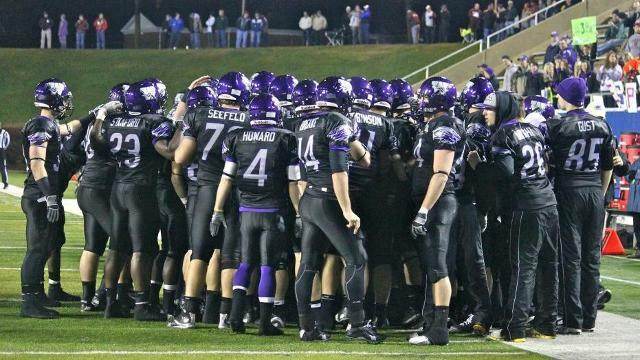 UW-Whitewater aims for its fifth. The Warhawks have defeated the Purple Raiders in their past three meetings (2009, 2010, 2011) here in Salem. Listen here http://d3football.com/videolink/stagg-bowl-41 as Pat and Keith provide play-by-play and analysis. Follow @d3football on Twitter for updates. We’ll try to take a more in-depth look here on the blog. Please chime in with anything you see that could swing the game in either direction. This should be a classic. Enjoy! Zach Howard, senior backup wide receiver for UW-Whitewater, posted this public note of thanks to his Facebook account on Thursday night. It’s an insight into what Division III football players everywhere could feel on the eve of their final career game. We share it here as part of the run-up to tonight’s Stagg Bowl XLI kickoff.